As Green-Wood’s historian, I never know where our next discovery will be coming from. I just know that it will arrive very soon. So it was this past Friday. I was working at Green-Wood, minding my own business. But, it turns out, an e-mail had just come in to our Green-aelogy supervisor, Christina Bickford. Christina, ever conscientious, thought that I, as the cemetery’s historian, might be interested in an inquiry about a doctor who had practiced medicine in Canada before his death in 1863. So she forwarded the e-mail to me and I took a look. The e-mail was from a woman who writes biographies of doctors who practiced in the towns of Chatham and Kent in Ontario, Canada. She was requesting a photograph of the gravestone of a Dr. Thomas Joiner White, if there was one. As of this writing, the Chatham-Kent Physician Tribute website features the biographies of 462 doctors who practiced in that area. One of those biographies is for a Dr. Thomas Joiner White, who, as per the very first line of his posted biography, was born about 1827 in Petersburg, Virginia. This immediately attracted my attention. Since 2002, when Green-Wood’s Civil War Project was launched, I have worked on more than 5,000 Civil War biographies. A man who was born in Virginia in the 1820s? I’m interested! If Dr. White was born in Virginia in 1829, he would have been in his early 30s when the Civil War began–and, it occurred to me–might have been a Confederate surgeon. Born to free parents in Petersburg, Virginia, White later received his medical degree at Bowdoin College in Maine in 1849, and was apparently the third African American in the United States to receive the degree. The intention was that he was to go to the black colony in Liberia, Africa, which had been established for American blacks by the American Colonization Society. 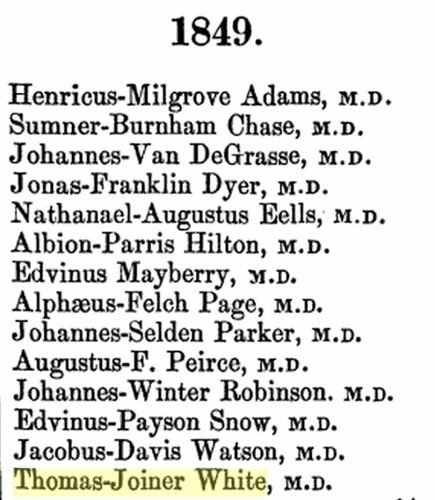 These are the individuals who were awarded medical degrees by Bowdoin College in 1849. Note the use of hyphens between first and middle names. Hyphens were very popular circa 1850–that is why both Wall-Street and Green-Wood Cemetery were spelled with hyphens back then. Researching further, I discovered that James McCune Smith was the first African American to receive a medical degree–he graduated from the University of Glasgow, Scotland, in 1837, at the top of his class. David Jones Peck was the first African American to receive a medical degree from a school in the United States, graduating from Rush Medical College in Chicago in 1847. 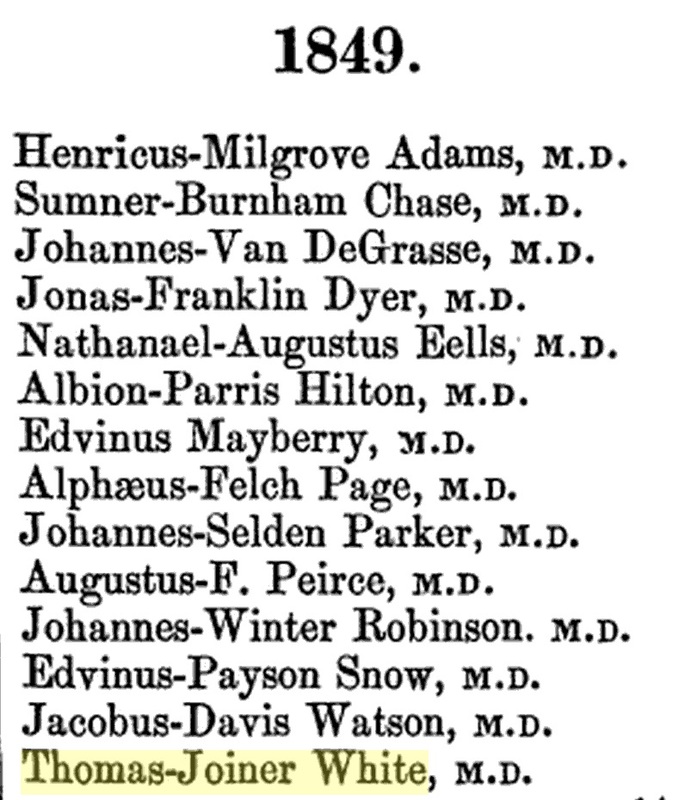 So, given that Thomas Joiner White received his medical degree just two years later, in 1849, it is reasonable to conclude that he was one of the first–and perhaps the third (as noted above)–African Americans to graduate from a medical school in the United States. In any event, Dr. White was certainly a pioneer doctor! So what became of Dr. White after he received his degree in medicine? He moved to Manhattan. As per the census of 1850, he was a physician living in New York City’s Fifth Ward (which ran from Broadway on its east to the Hudson River on its west and Canal Street on its north to Reade Street on its south–today the neighborhood of Tribeca) on a street populated by African Americans; all of those for whom race is listed on the census page on which he appears are listed as “B”–for black. The 1850 federal census listing for Dr. Thomas Joiner White. Click to enlarge. Dr. White practiced in New York City, then Canada, before he fell ill and died tragically of cholera in 1863. The record of Dr. Thomas Joiner White’s interment at Green-Wood. Click for a larger image. The second part of the entry recording Dr. White’s interment. Click for a larger image. Returning to the biography on the Chatham-Kent Physician Tribute website, I read this: “Dr. White was an activist who served as Secretary of the Legal Rights Association and the Committee of Thirteen, a black anticolonizationist and vigilance organization.” The Committee of Thirteen was formed in 1850 by African Americans in New York City to protect fugitive slaves from slave catchers, to assist those who had escaped to freedom in Canada, and to oppose racial prejudice. The Legal Rights Association was formed in 1855 to challenge racial discrimination in New York City’s public transit system. A few days ago I seemed to be in the full enjoyment of health and life-but, alas, how changed now, for Saturday last I was attacked with “Cholera Morbus,” and just as I supposed I was about well of that erysipelas of the face, claims me as a victim. This last disease will most likely terminate my earthly career. O Lord, if thou hast ordered it so to be, Thy will be done-One favor I would ask and that is, that you, my little child, may always enjoy Thy especial care; early may she learn to love Thee and always walk in Thy paths. Lord bless my dear Mother, my Wife and my beloved Father. Oh, God! Bless the cause of human liberty-may colored men prove themselves worthy of the trust committed to their hands, viz: the emancipation of their race from slavery-Strike the oppressor wherever you find him. Freedom now or never. I was just endeavoring to consummate arrangements with the Secretary of War whereby I should have returned to my native land and joined some of the “colored troops of the U.S.” But my Lord and Master, it seems intends taking me to himself-glory be to His holy name. -Thomas Joiner White, Chatham, July 10th, A.D. 1863. I should like to be buried in Green-Wood Cemetery, Brooklyn. -T.J.W. On August 19, 1863, Dr. Thomas Joiner White, as per his dying request, was interred at Green-Wood. But why Green-Wood? I checked the listing for the lot where Dr. White was interred–section 31, lot 9817. And paydirt again! Seeing the list of those interred in that lot (22 individuals), I immediately recognized it as that of the prominent African American Brooklynites Elizabeth and Reverand James Gloucester and their family members. I have featured them on my annual Black History tour of Green-Wood for several years now. Elizabeth Gloucester was a fascinating woman: an African American self-made real estate tycoon who used her very substantial skills to become a millionaire–the wealthiest woman of color in America, as per her 1883 obituary in the Brooklyn Daily Eagle. She was a friend of Frederick Douglass and of John Brown; she contributed funds to Brown’s ill-fated 1859 raid of Harpers Ferry, Virginia, during which he had hoped to trigger a slave rebellion throughout the South. Brown told her, just before his fateful raid, that given her courage, he would have been proud–were she not a woman–to have her join his raiding party. She was also a philanthropist, donating to organizations in the South that were educating freed slaves after the Civil War and to the Colored Orphan Asylum. Rev. James Gloucester was the founding pastor of the very prominent Siloam Presbyterian Church in Brooklyn; he also was Douglass’s friend. For more on the Gloucesters, see the brilliant 3-part series that appeared in Brownstoner here, here, and here. Detail of the Gloucester memorial. Note that there is only one inscription on it–for the matriarch of the family, Elizabeth Gloucester. This granite is the only memorial in the Gloucester family lot. I returned to reading Dr. White’s biography on the Chatham-Kent Physician Tribute website. 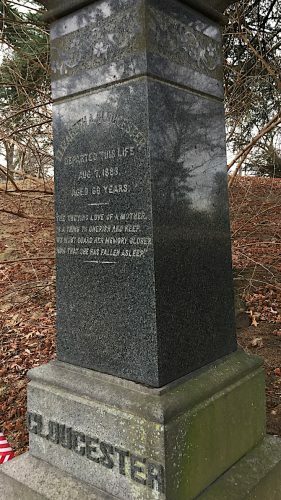 Given the information there, it was soon apparent to me why Dr. White had been interred in lot 9817 at Green-Wood: his wife, Emma, whom he married on February 11, 1857, in Manhattan’s Broadway Tabernacle, was the eldest of the eight children born to Elizabeth and James Gloucester–lot 9817 was owned by his in-laws. Emma, and two of her sisters, were graduates of Oberlin College–the first college in America to offer admission to women in its bachelor’s degree program (in 1837) and one of the first in the country to admit African Americans (circa 1840). After her husband’s death, Emma returned with her two children (one of whom was named Elizabeth, ostensibly after her mother) to live in Brooklyn, where she had grown up, and worked as a schoolteacher. 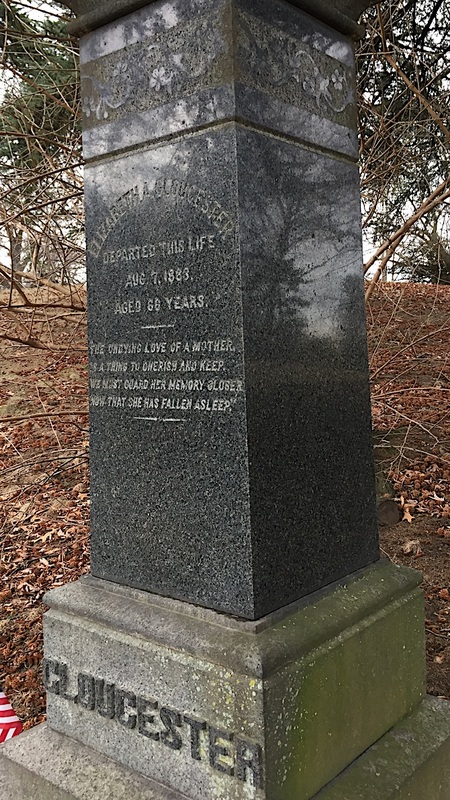 She remarried, had another daughter, and died in 1885. 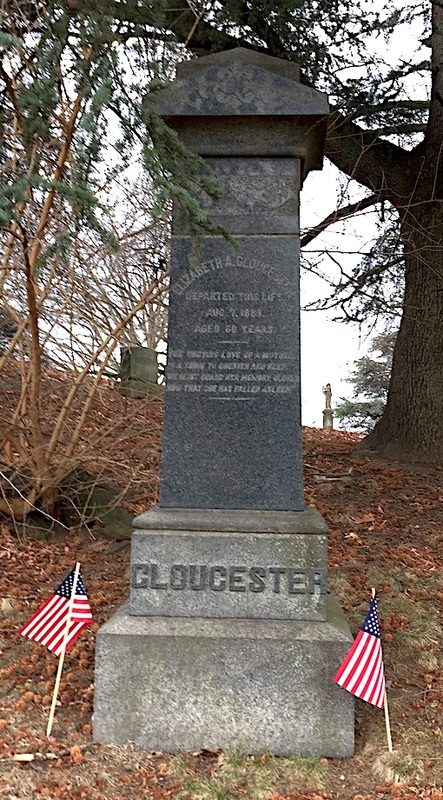 She was interred in the Gloucester family lot at Green-Wood under her remarried name, Emma Blanchard. February is Black History Month. What a good time to discover the story of Dr. Thomas Joiner White–pioneering African American leader and doctor! He will be featured–as well as Elizabeth and James Gloucester, and many others–on my upcoming “Black in Brooklyn” tour. Bowdoin College, Chatham-Kent Physician Tribute, David Jones Peck, Dr. Thomas J. White, Dr. Thomas Joiner White, Elizabeth Gloucester, Elizabeth White, Emma Blanchard, Frederick Douglass, James Gloucester, James McCune Smith, John Brown, Thomas J. White.